When I took the phone call to accept this assignment, I was excited. 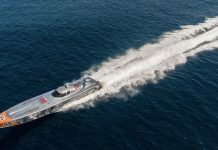 We have all seen and read about Mercury Marine’s remarkable Zeus pod design and MeCruiser’s Axius system. We all know the technology works and that it has been proven (more than 25,000 hours of endurance testing) to be effective and function the way it is intended to. To get the chance to test this all-new Joystick Piloting System on Mercury’s Verado Outboards and report back to our readers was incredible. 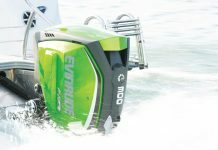 Similar to the Axius and Zeus technology, you can use the outboard system’s joystick to move the boat sideways, at an angle, or even pilot the boat in close quarters without having to use the throttles. 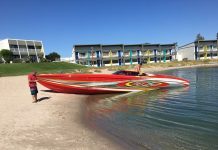 The system will allow any boater of any age – even an absolute novice – to effortlessly move their boat in any direction with the push or twist of the joystick. The key to the system is that each engine is independent and is able to articulate and move independently of the other. 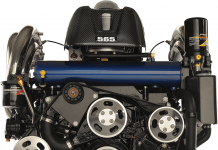 It’s the next logical step: big boat technology applied to smaller boats with outboards. When you look at the transom of the boat you will not notice much difference from the engine rigging with this system compared to others. In fact, it’s a cleaner installation. The system uses the original hydraulic steering cylinders that are on the Verado engines. The only alteration is that the system adds an electronic actuator to the motor. One thing you will notice is that there is no longer a stainless tie bar connecting the motors. There is, however, a cable that connects the engines together. This flexible cable allows the engines to turn away from each other, but effectively limit the amount that they can turn inwards towards each other. It acts merely as a failsafe just in case of a hydraulic failure, to ensure that the propellers cannot collide with each other. A unique feature that Mercury has developed is the charging system on the engines. 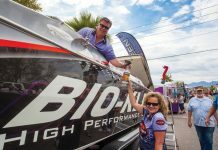 Since they anticipate that boaters will use the system for long periods of time at low speeds, the system will automatically increase your idle rpm to a range that will effectively charge the boat’s batteries so they don’t drain faster than they are charging. This is done without using a different alternator or having to require you to monitor your gauges or to manually turn on a system. 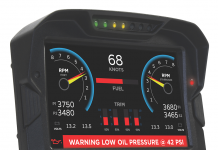 When at idle speeds and in docking mode, a touch of the joystick will automatically trim the motors to an optimal level for efficient control and handling. The system can be overridden with a tap of the trim and tilt switch on the throttles. 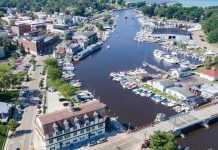 This is another great example of how Mercury has thought through the different scenarios and how an average boater will use the system. One slick feature I really enjoyed on the system, which creates safe docking in windy or high current situations, is the Skyhook feature. 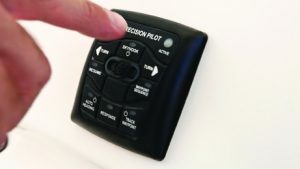 With the push of a button, the joystick system will retrieve information from the GPS and keep the boat in its place without moving. I view this as a safety feature because we have all been at the docks trying to tie up the stern while the bow floats in a different direction or where someone on the boat tries to reach for the dock. With the Skyhook system, hit the button and at your pace, walk around the boat and properly and safely tie the boat to the dock. This is also a great feature for fishing. When you get to your favorite fishing hole, hit the Skyhook button and your boat will sit on top of your spot without you having to continuously stop fishing and move the boat back to where it previously was. While I was on the water, I used the system in a situation that we all find ourselves in from time to time. I came around the corner at the marina to dock, the boat was in a slight current with the wind and rain, and a larger boat was pulling out of their slip. 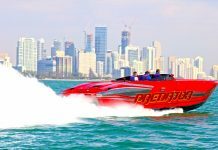 Instead of having to use the throttles to keep me in place, I turned on the Skyhook system, sat back and allowed the boat to back out of its slip without me having the worry of jockeying to stay in place or having to worry about drifting into other boats – amazing. The Joystick Piloting System takes the guess work out of docking. 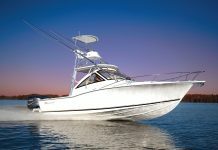 It creates a stress free situation every time you leave and come back to the dock, and it gives you the confidence to handle your boat like a real pro. The joystick gives you direction and thrust at the tip of your fingers and provides you with the ultimate control of your boat. With the piloting system you are now able to rotate a Verado outboard powered boat 360°, or rotate the boat in a space the same size as the boat you are in. 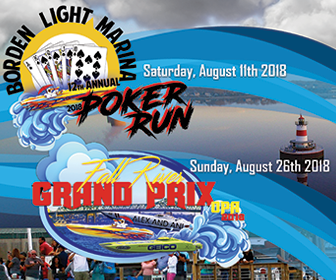 The Joystick Piloting System will take the embarrassment factor out of the dock equation and will make any captain look like a seasoned boater each and every time. This system will turn docking your boat to one of your favorite parts of the day and something that you actually enjoy. 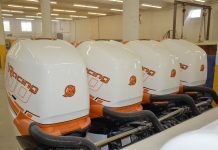 The all-new Joystick technology is currently only available on 250 hp Verado and 300 hp Verado outboards and can be installed on dual, triple or quad applications. I hope to see this technology on the smaller Verado motors in the near future so that all power categories can enjoy the use of the technology. The only thing that I was a little disappointed with is that the system cannot be installed on current Verado motors in the field. 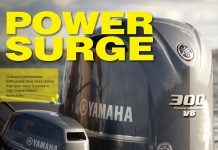 If you want the system, you will have to re-power your boat. 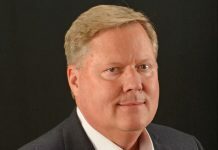 A call to Kevin Hellman, Associate Product Manager, Controls and Rigging confirmed that for now, the system is available for OEM installs only, but very soon “…selected dealers will also be able to source it for full repowers.” Expect a full rollout in approximately June 2013. 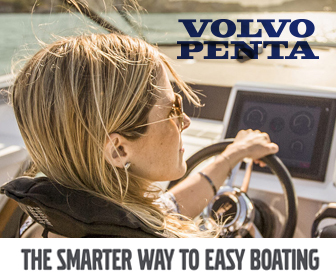 Using the Joystick Piloting system in conjunction with Mercury’s all-new Vesselview, Skyhook, the control pad on the DTS throttle, Waypoint sequencing and auto heading will create a complete package and system that will ensure a worry free day on the water and an effortless day behind the wheel. 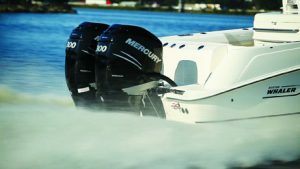 Mercury’s goal was to create a system that will take the worry out of boating and create a stress free environment. 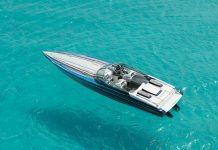 They have not only done that, they have exceeded most anyone’s expectations and delivered a package that is reliable, durable, safe, and takes boating to new heights. 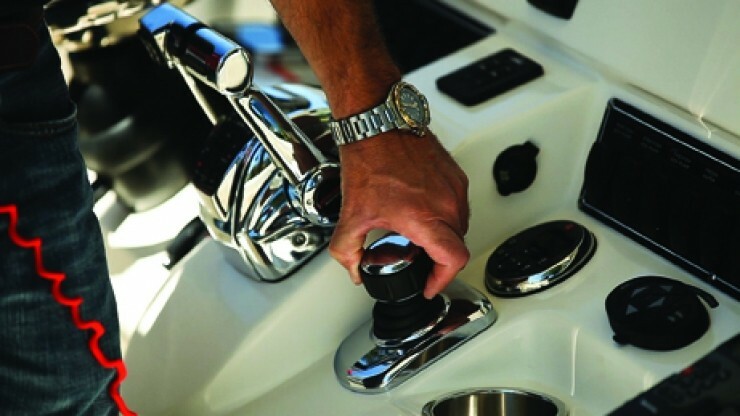 If you are like a lot of my friends whose wives get nervous when they dock or will not run the boat because of close quarter maneuvering, the Joystick Piloting System will allow boaters to effortlessly and safely move their boats in any direction with the twist of the wrist or touch of a button. Thus it takes the stress out of tight quarter maneuvering and potentially in less than ideal conditions that we all encounter from time to time. I personally have a friend trying to convince his wife to get a boat, but she is nervous. 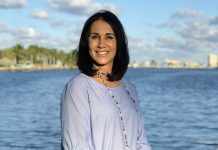 This winning system should be the convincing factor that will nudge her in the right direction and have yet another family on the water in the spring. 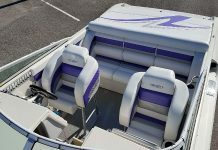 Next articleMTI-V 42 CENTER CONSOLE – The Most Innovative Boat Of The Year!